Saint John the Baptist was the last of the Old Testament prophets and the first saint of the New Testament. A forerunner of Christ, he prefigured the coming of the Messiah. 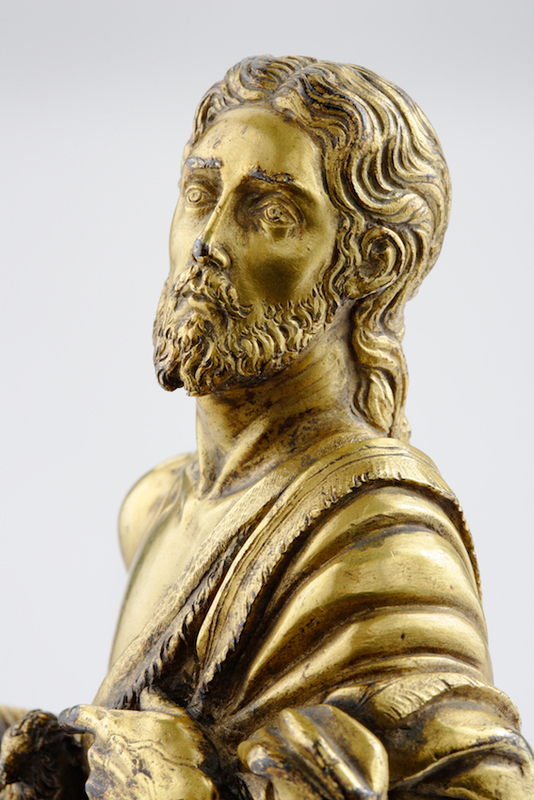 He is identified in this remarkable gilt bronze by his camel hair tunic (Mathew 3:4 and Mark 1:6. ), the lamb and the book he holds in his right hand (John 1:29). The bronze was expertly cast and chiselled with great finesse and attention to detail. The veins in the hands are delineated, the tunic’s fur is textured and the face is carefully modelled. 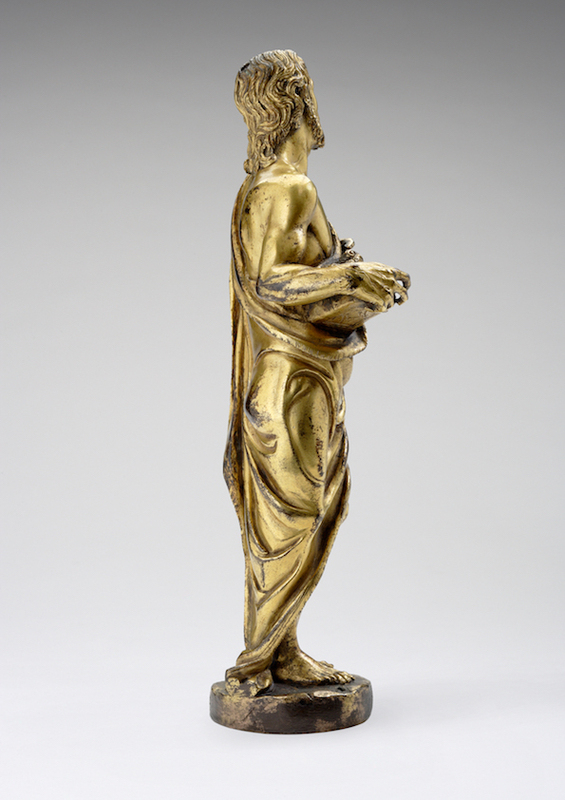 The bronze retains its original gilt patination, which is worn in a manner consistent with age and use. 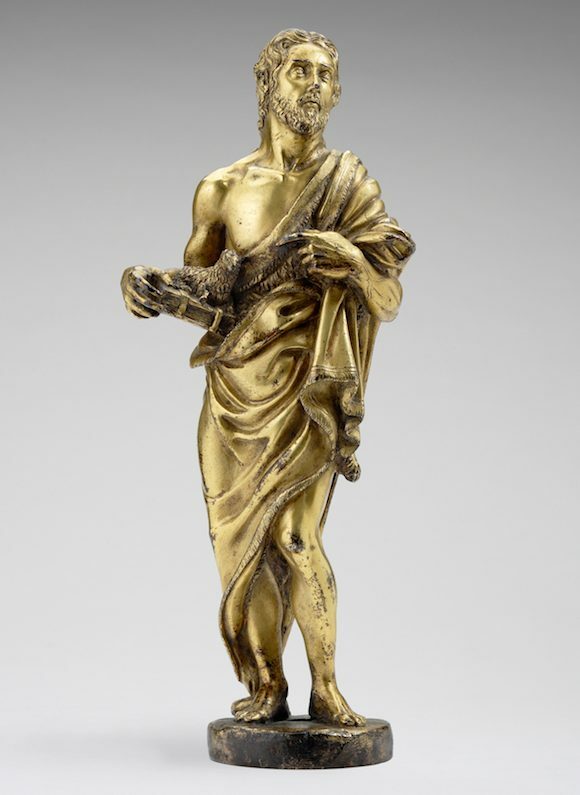 The present bronze of Saint John the Baptist was most likely cast to stand atop a marble holy-water basin, or stoup (which explains the wear on the bottom half of the bronze). The graceful style of the composition, the wistful expression, and drapery folds recall the St. John the Baptist print by the humanist draughtsman and printmaker, Giulio Campagnola (c. 1482-after 1515) (fig. 1). Campagnola’s design was influenced by Andrea Mantegna (c. 1431 –1506) and is entrenched in a Venetian stylistic mode. 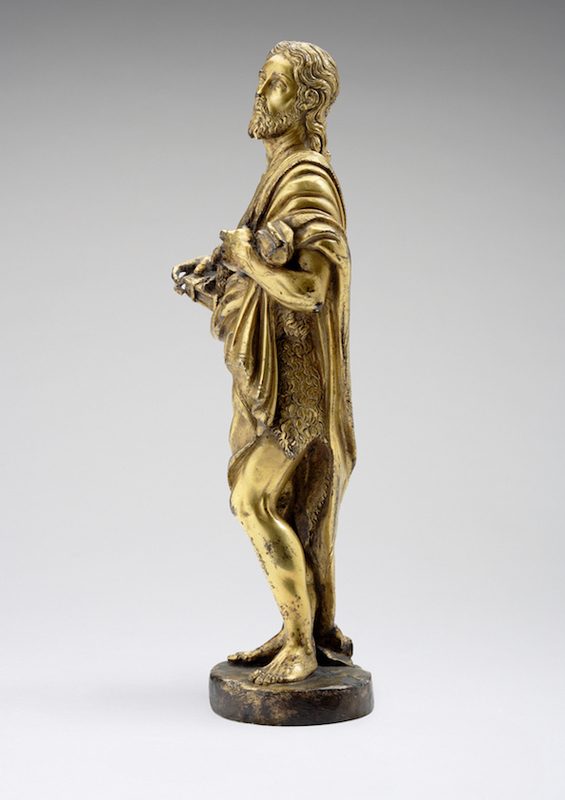 Although the figure style of the present bronze demonstrates a Venetian humanist influence (likely a result of the dissemination of the print throughout Italy), the drapery style, casting and chasing of the bronze expresses a refined feel commensurate with the sixteenth-century foundries of Rome or Florence. 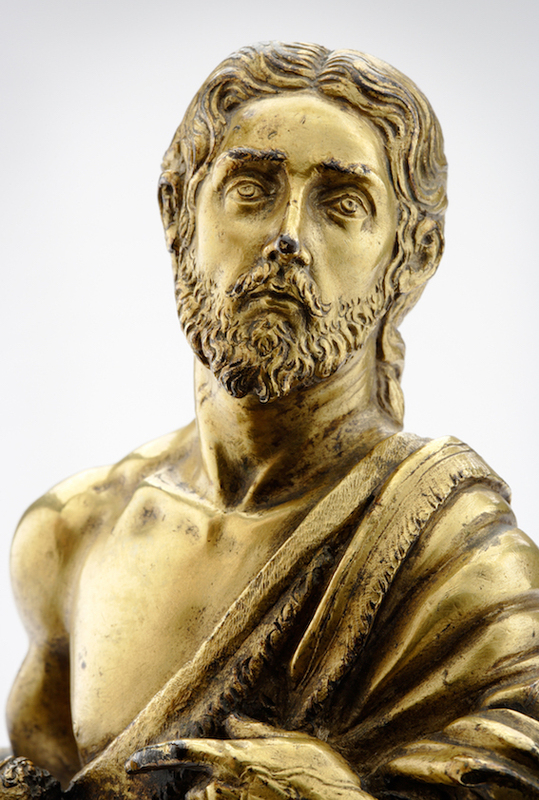 Although there are varied possibilities for precise authorship, the present bronze St. John the Baptist can be placed firmly within the circle of the great high Renaissance sculptor Andrea Sansovino (1467-1529). 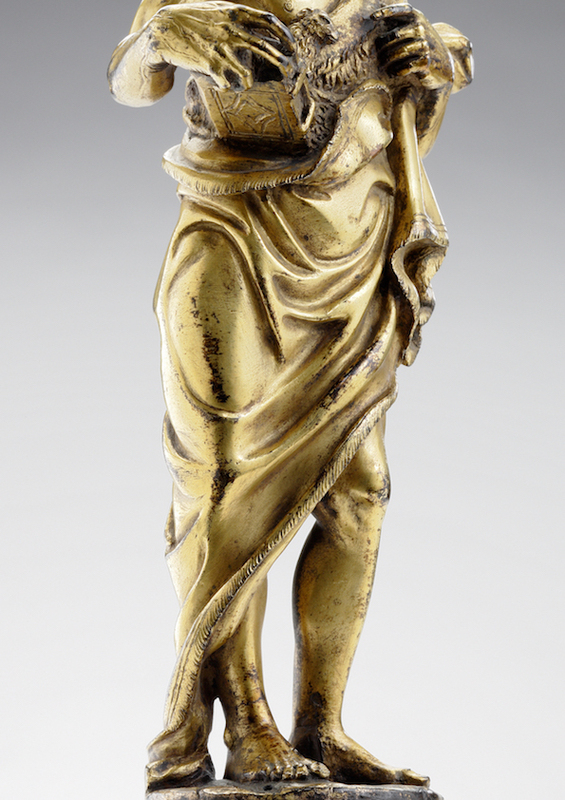 The composition is a noble invention that marries classicism and naturalism and the bronze is a refined cast that indicates an author with a highly developed knowledge of expression and technique. Andrea Sansovino, who was trained in Florence and worked in Rome, was both an architect and a sculptor in bronze as well as marble. He invented the language of high Renaissance sculpture and trained many of the great sculptors of the following generation, two of whom are also potential authors for the present model. Among the large-scale commissions Sansovino received are St. John Baptizing Christ over the east door of the Baptistery of San Giovanni in Florence (finished by Vincenzo Danti, 1505) and a marble font in the Volterra cathedral (1502) (fig. 2). The figure of St. John the Baptist from the Baptistery and the figures on the reliefs of the font exhibit similar classicizing proportions, pose and grace as the present bronze. The font was commissioned by the commune of Volterra in 1502, and it once included ‘a little statue of St. John the Baptist’ that was removed in 1772 to decorate a holy water font in the front of the cathedral. The statue is now lost. (Huntley, pp. 48-9). One of Sansovino’s greatest works, the marble group of the Virgin and Child with St. Anne (1512; Rome, S Agostino), displays a type of drapery with deep recesses that is reminiscent of the present bronze. A small gilt-bronze copy of this group now housed in the Victoria and Albert Museum, London was cast in Rome in the middle of the 16th century (fig. 3). Sansovino inspired and trained a group of young artists, some of whom maintained the classicism, roundness of form, softness of line and harmony of drapery of the master. His most famous apprentice was his namesake, Jacopo Sansovino (1486-1570), who brought the high Renaissance to Venice. 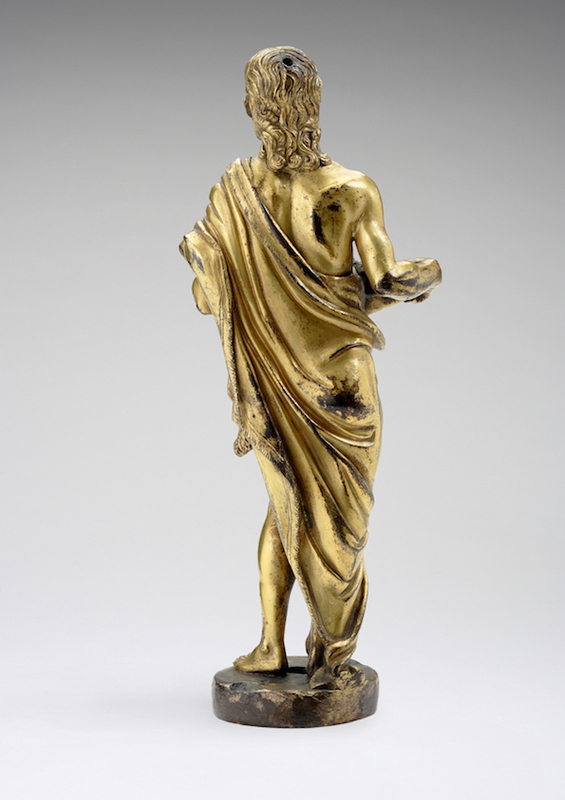 The influence of Andrea is clear in Jacopo’s early sculptures, however as he matured he developed a figurative style that is more emotive and less graceful than Andrea’s mode and that of the present bronze. 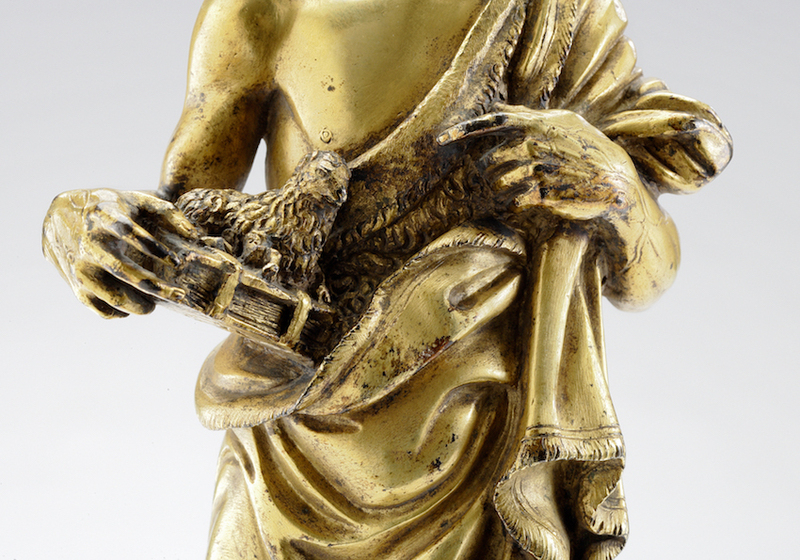 Jacopo’s St. John the Baptist (bronze, Vienna, Lichtenstein Museum) demonstrates this distinct difference. Raffaello da Montelupo (1505-1567), who worked on his first major commission with Andrea on the façade of Santa Casa in Loreto, maintained the master’s classicizing manner throughout his career. First trained by his father, Baccio da Montelupo (1469-1523) and the goldsmith Jacopo di Michelangelo Viviani in Florence, he had a facility with marble and bronze. Raffaello worked closely with Michelangelo in Rome. His St. Michael (c. 1536) for the top of Castel Sant’Angelo demonstrates the stocky figure type, pose and pensive expression of the present gilt-bronze St. John the Baptist. Francesco da Sangallo (1494-1576) also worked at Loreto as a pupil of Sansovino. His style is more languid than that of Andrea’s yet the master’s influence is sustained throughout the younger sculptor’s career. Sangallo’s marble St. John the Baptist (Florence, Museo Nazionale del Bargello, c. 1520) also exhibits similarities with the present bronze including the distinct musculature, poised hand, pronounced upper lip, strong nose, and square jaw. Sangallo’s work in bronze, however, is an under-explored field, with no documentary evidence definitively linking any bronze to the sculpture’s oeuvre. Yet Sangallo did execute bronzes, as indicated in his will of 24 September 1574. 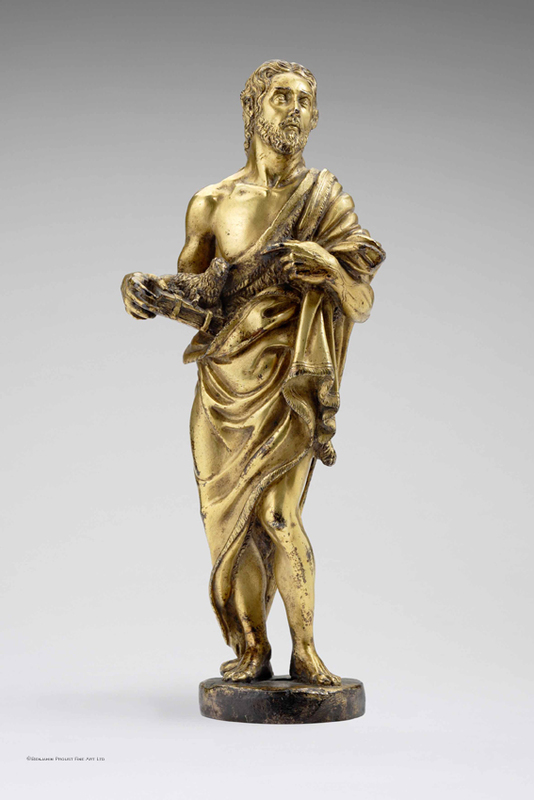 Two bronze models have been attributed to the artist, a signed St. John the Baptist in the Frick Collection (1538), of which many copies exist and whose attribution has been questioned, as well as a Flora which was offered for sale at Sotheby’s London in 2008.